The Better Health Partnership drives high-quality care, and that drives better health. We are transforming health care systems to improve the health of individuals and our community. We support value-based payment models to accelerate better care and lower costs. Trauma is an event, series of events, or set of circumstances that an individual experiences as physically or emotionally harmful or life-threatening and has lasting adverse effects. Our trauma-informed care webinar series begins with a review of how trauma affects the brain and how it manifests in beliefs, behaviors, and activities of traumatized individuals. Presenter Elizabeth Boyle, MBA from Ohio Department of Developmental Disabilities provides a perspective that helps define the hallmarks of trauma-informed agency protocols, and universal precautions against re-traumatizing vulnerable populations. Access the webinar here. 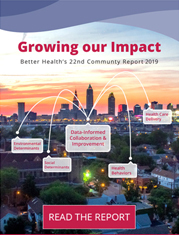 Better Health announces plans are underway to bring a successful "pay for performance" model called Pathways Community HUB to Cleveland to help combat infant mortality. The organization is working with the city-county infant mortality coalition, First Year Cleveland, as well as other local public health agencies, to design a HUB for the region. The model has so far delivered impressive results in the area of infant health: in Mansfield, where the HUB has been operating the longest, women who participated delivered low-birth-weight babies at less than half the rate of those at the same risk level who did not participate. Read the article on cleveland.com here. Better Health is proud to honor 47 practices from 8 reporting health systems with 2017-18 Gold Stars. The practices have earned special recognition for their high achievement and outstanding improvement on crucial measures of care for adults living with diabetes and/or high blood pressure, as well as on screening for colorectal cancer. Congratulations to all of our partners and to their patients! Access the 'Gold Star' practices here. Not able to join us on March 1 for our Community Report release? Or did you attend but would like to revisit the inspiring messages presented? Speaker presentations are now available on our Data Center website. View the presentations from Better Health President and CEO, Rita Horwitz, Better Health's Chief Data Scientist Thomas E. Love, PhD and our terrific keynote speaker Peter Pronovost, MD, PhD, FCCM, Chief Clinical Transformation Officer from University Hospitals. Access the presentations here. Our latest report details more than 475,000 children and adults in the care of about 1,000 providers in nearly 2,000 practices of 11 health systems. New priorities include behavioral health, senior health, Summit and Cuyahoga County community health improvements and more. Read report here.